The babies are all grown up. 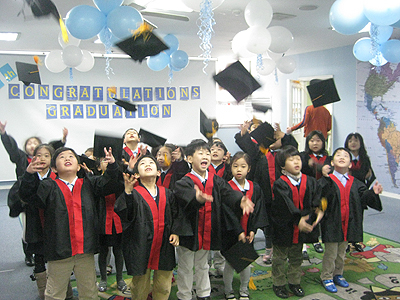 Last Friday, my and Evan’s little kid classes donned their adorable cap and gowns, recited their five-sentence speeches about life after kindergarten, and celebrated their transition into elementary school with their teachers, families and fellow students. After weeks of preparation, it was finally their big day! 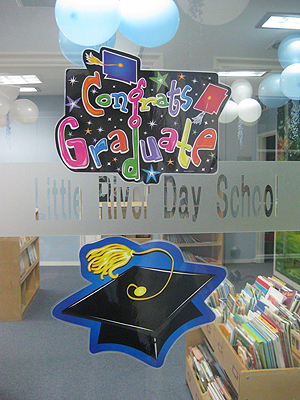 The school was decked out with lots of blue and white balloons, and a grammatically questionable (but well-intentioned) sign for the graduates. Even though we had to wear our uniforms, I decided to spruce up the baby blue polo with my fancy headband from Myeongdong. Yoon Jung had to give it a whirl. Perhaps it was slightly pouf-tastic for her tiny dome. She’s such a cutie! 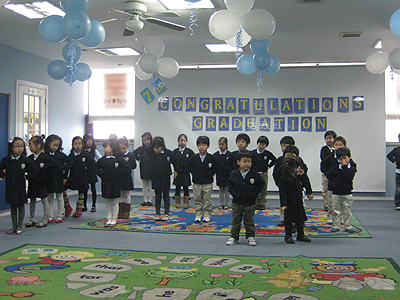 The graduates, along with the babies, sang songs during the ceremony. They did a full run-thru of the show before their parents arrived, all spruced up in their uniforms. The Ants Go Marching, Here We Go Looby Loo and She’ll Be Comin’ Round the Mountain were on the play list for the occasion. 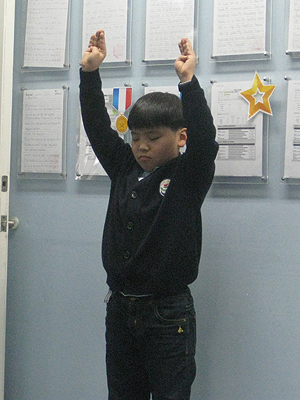 Apparently, one of my students decided he wanted to take the stairs to school instead of following directions and riding in the elevator, so he had to stand against the wall, eyes closed with arms in the air for at least fifteen minutes. He is officially ready for Survivor. After all the singing and speaking and photo ops and flowers, Evan and I retreated to T.G.I. Fridays for our own celebration of the year we’ve had with our babies. 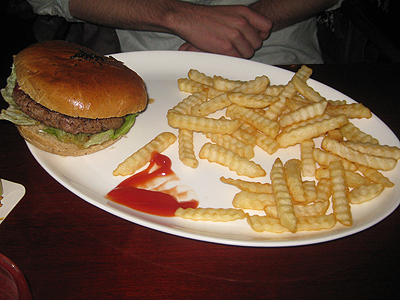 We were starving by the time our burgers arrived, and gobbled them down quickly. 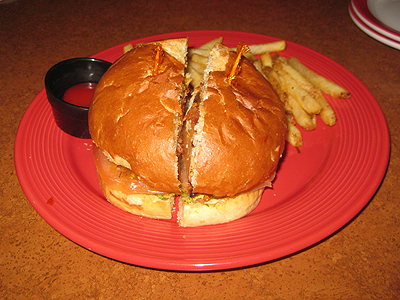 Evan went for the regular burger with bacon and American cheese, while I opted for the grilled chicken, bacon and Monterey Jack sandwich. Last weekend, my girlfriends and I decided to escape to the big city for two whirlwind days of shopping, foreign food and live music. 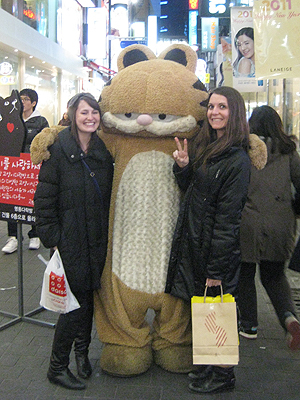 I awoke early on Saturday morning to catch a bus to Seoul with my friends Rachel and Jenny Ryan. 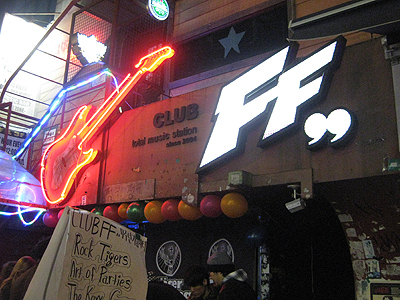 We headed straight for Hongdae upon our arrival, and dropped our bags at our crash pad for the night, Backpacker’s Space. The hostel, which was roughly 90% occupied by our posse, was adorable, clean and comfortable. It featured three rooms with bunks and fresh linen, one (western-style) bathroom with countless toiletries, and a vanity corner with a hair dryer and a straightener. 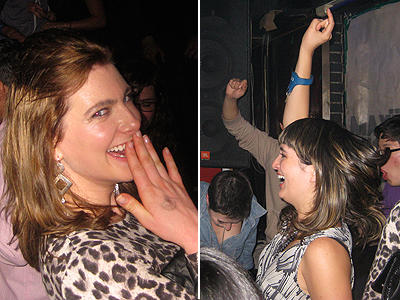 I died, since I hadn’t straightened my hair in 10 months — I was waaaaay too excited. The owner was pleasant and helpful, and a water cooler with cups was a welcome amenity during the wee, hungover hours of the morning. Plus, it was located in the heart of the bustling University district, so we were just a hop, skip and jump away from the clubs where we spent our night bobbing and dancing to jams. So we ditched our packs and headed to Dos Tacos for some food. 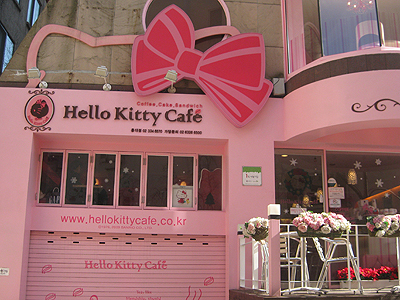 It was the same restaurant that we visited in Gangnam with my ‘cuz last summer, but the Hongdae location. 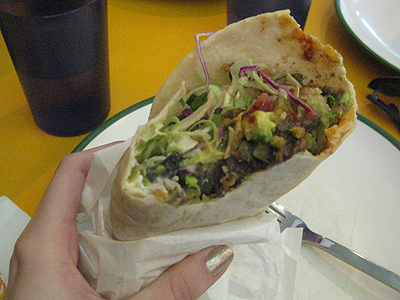 Meat and avocado burrito, yummers. Just per-fec-tion. 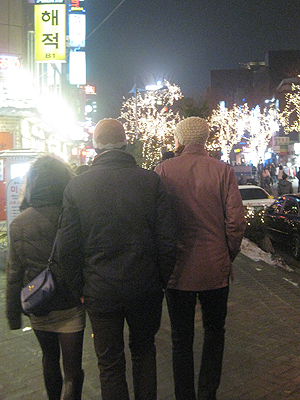 Afterward, we took the train to Myeongdong to do some serious retail damage. 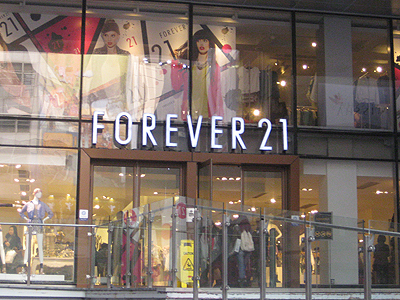 I couldn’t get out of Forever 21 without a necessary top… or five. Oooops! We also ran into a grungy, creepy Garfield in the midst of our shopping spree, nbd. On our way home, we got wrapped up into a conversation and missed our subway transfer (whoops) but eventually made it back to the hostel! We grabbed some beer, dolled up and got ready for our night on the town. I chose one of my new tops from F21 and paired with with a black skirt, black tights, black boots and my Lady Gaga ring. Faboosh! 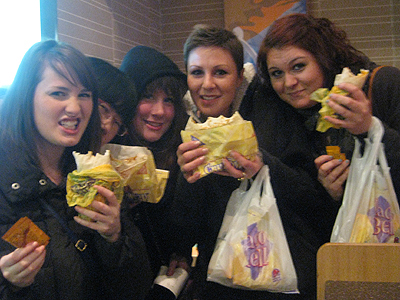 The crew, about 15 women deep, rolled to T Bell to grab some more Mexican grub before going out to Club FF. 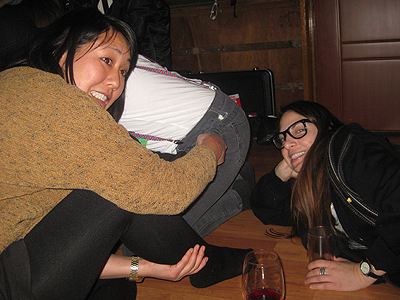 I ate a taco, and a burrito… and part of Sasia’s quesadilla… and Priscilla’s nachos. Yeah. Bad move leaving me around available food. 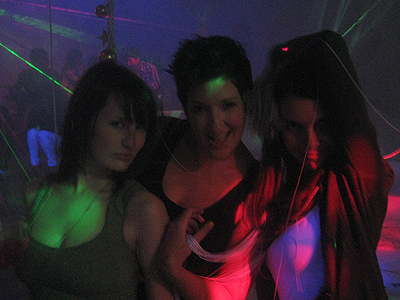 Club FF was awesome! The event was the 7 year anniversary of the hot spot, and had a bunch of great bands to celebrate the occasion. The first act we saw was Kingston Rudieska, an awesome ska band. At 11 PM, the bar started serving FREE cocktails that we enjoyed for an hour. Needless to say, I only bought one beer during our stay. 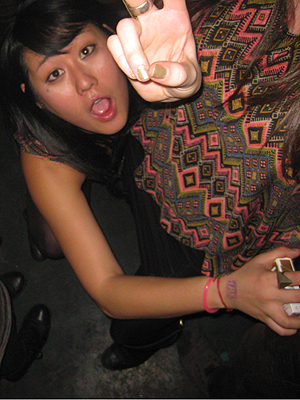 Later in the night, I decided to meet up with Alyssa at Shake! a mile-a-minute underground dance party. Alyssa popped into Club FF to tell me her location after her phone went missing, and we realized we were wearing the exact. same. outfit. 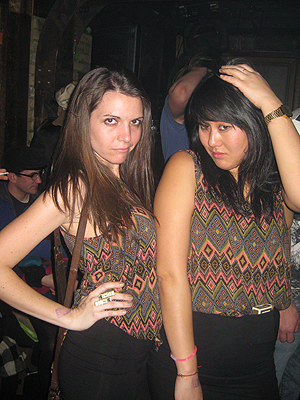 We had both purchased the same shirt that day without realizing it, and went on to dress ourselves in the same threads. 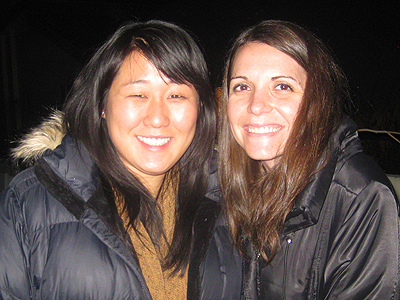 It was hilariously mortifying — we looked like a Korean couple on their honeymoon. 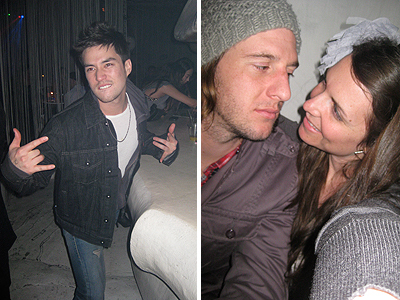 We stayed at Shake for hours, went back to Club FF and shook it til the wee hours of morning. I scraped myself out of bed in the morning, showered and enjoyed a picturesque cup of coffee while I waited for my ladies to get ready. 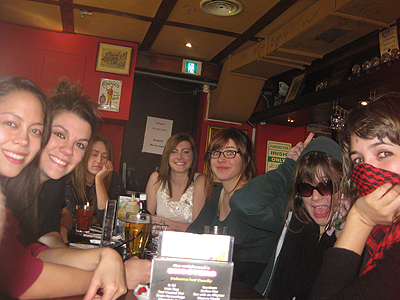 After everyone was awake, we cabbed it to Itaewon to get some pub grub at Wolfhound. Rachel was sooo very excited to get her Bloody Mary. 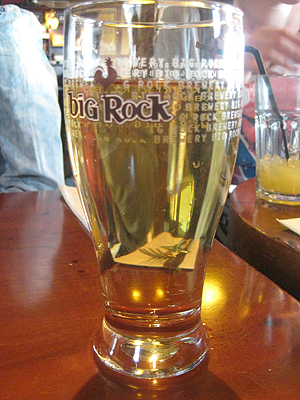 I skipped my own Mary for a pint of strong cider, and went crazy for their menu. 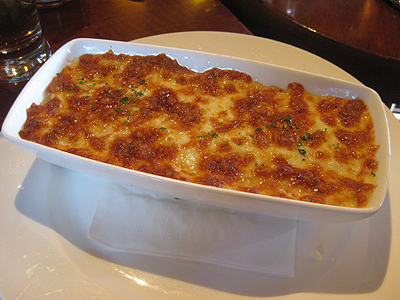 In the end, I opted for a shepherd’s pie and a side salad with ranch. RANCH DRESSING! The second time I’ve enjoyed the creamy, fatty goodness in ten months. Yum! Evan probably would have guessed that my eyes won a competition over my stomach during this meal, but I ate every last bite. Nom nom. Being the wonderful girlfriends that we are, Rachel and I popped into Quizno’s on our way home to pick up sandwiches for us and boyfs to eat for dinner, which I enjoyed with Ev after a sleepy bus ride home. Valentine’s Day was all sorts of perfect — I mean, what’s better than a day you get loaded up on chocolate truffles, students bring you gifts and tell you they love you, your boyfriend dotes and you have a heavenly V-Day dinner at your favorite restaurant? This past weekend, I spent a few hours putting together heart goodie bags for our kiddies from the mountain of supplies sent in Valentine’s packages from my parents and Steve and Jill (thank you, thank you, they were fabulous <3). All of our kindergarteners squealed and gasped when they opened their baggies. Stickers! Heart-shaped rubber bands! Laffy Taffy! 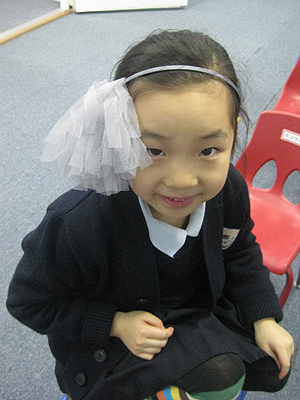 They were especially excited for the candy hearts with messages on them — they don’t have those little V-Day treasures here in Korea, and we recently read about them in a story, so they’ve had a hankering for them ever since. Our students got us treats too. 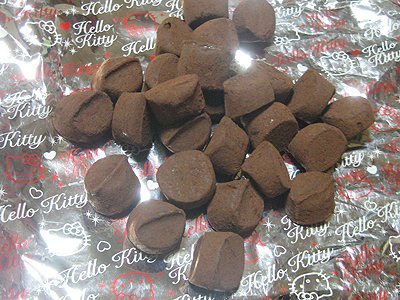 One of my students, Han Bit, gave me these luscious truffles… in Hello Kitty paper, obviously. 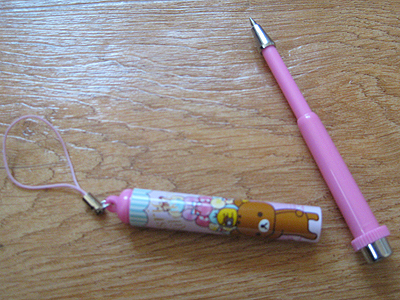 Another student, Ji Oun, gave Evan a miniature pen cell phone charm so he could give it to me. You know, in case he forgot to get me a present. She’s got my back! Luckily, I have an amazing boyfriend who not only remembers to get me a Valentine’s gift, but this year gave me what is hands down the best gift I’ve ever received. 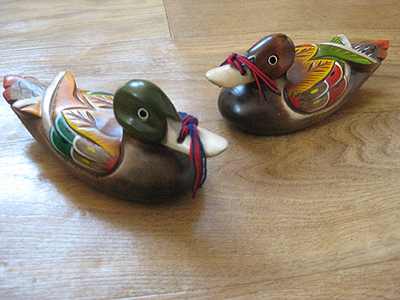 In Korea, it is traditional to give a bride and groom a pair of wooden ducks on their happy day. The ducks symbolize the partners in the relationship, and since it is a Confucian belief that Mandarin ducks mate for life, they are meant to represent fidelity and loyalty. It is believed that the man who carved the ducks passes on five fortunes to the happy couple: wealth, health, life-long marriage, a good wife and lots of sons. 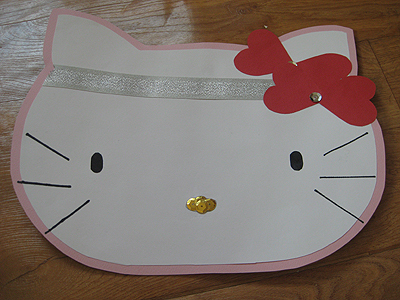 In return, I made my man a Headband Kitty valentine (because he likes when I wear headbands, and bow clips are so last year), chocolate (he’s an addict) and a date night gift certificate for T.G.I. Fridays and Lotte Cinema. 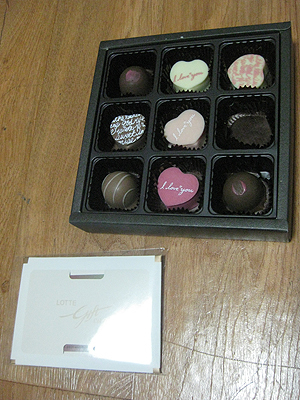 Best Valentine’s Day ever, most definitely! In addition to our excursion to Taco Bell, we noshed on flavors that have been dearly missed from my palette. From Middle Eastern and Mexican to sandwiches and burgers, the food was so delectably different than the fare offered in Jeonju. On Thursday, I was finally able to peel myself out of bed to meet up with friends for a delicious Arabic meal. 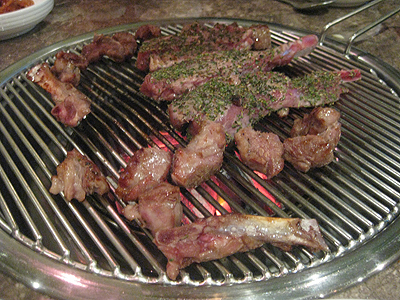 We headed to Alyssa’s ‘hood, near Hongdae, to feast at Petra. 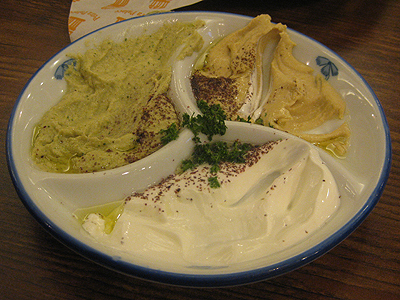 We started with a trio of hummus, baba ghanoush (eggplant dip) and labaneh cheese, with a side of warm pita bread (real pita, not the flour tortillas we so enjoy at Aladdin’s Lamb). I barely got this picture before it was devoured. 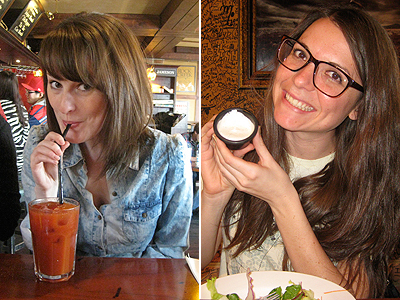 We ordered another round of the dips for when Rachel and Greg joined us at the table. 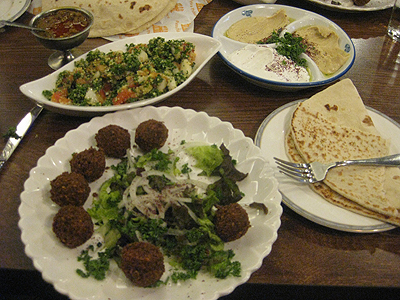 I also ordered delicious falafel, tabbouleh and pita to mix with the tasty round of condiments. Oh em gee… the best falafel I have had in such a long time. 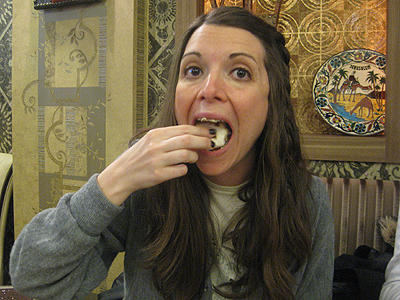 I couldn’t stop myself from shoveling food into my mouth. Ev got the lamb and cous cous. There was a lot of serious nom nom going on at the table. The next day, we traveled around the city to shop and see the sights. After Evan got fitted for a custom-made suit (so handsome) in Itaewon, we stayed in the foreigner-friendly area to get a taste of a more “authentic” Mexican restaurant. Vamos comemos! 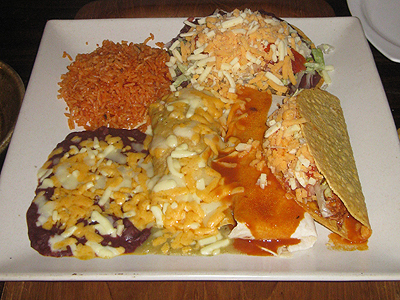 We ended up at a place called Los Amigos, and while it wasn’t Baja Sonora, it certainly touched on my unsatisfied desire for So Cal Mexican food. 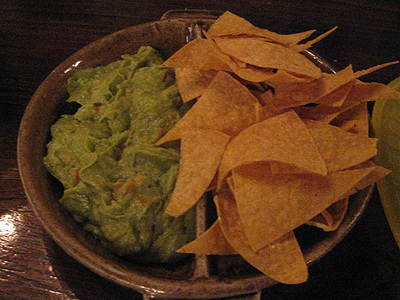 We ordered chips and guacamole to start, then a combination platter to share. The plate came with plenty of food, and allowed us to try a variety of entrees instead of having to choose just one or two. We ate a taco, a burrito, a tostada and an enchilada complete with beans and rice. It. Was. So. Good. They even had sour cream! Imagine me shoveling chips into this mess of a plate, then dunking them in guacamole and sour cream before taking a huge bite. 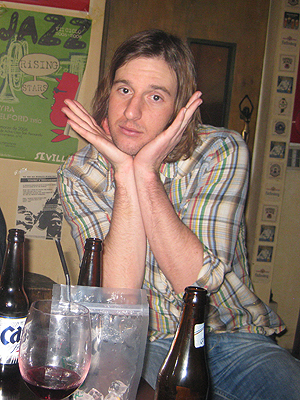 I’m telling you, pure nirvana. 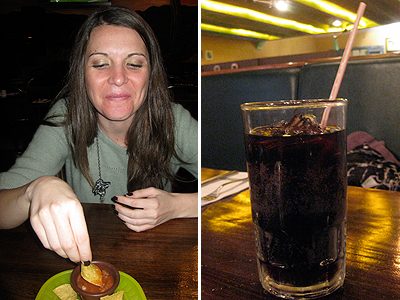 Ev was particularly stoked on the American-sized soda, which is about four times the size of the cups you get at Korean restaurants. No joke, I’m actually used to drinking 8 ounces at a time. I keep thinking of that cheese/beans/sour cream combination, and it’s seriously depressing me when I have broccoli soup staring back from the fridge. Le sigh. That night, we set out to find perfect, juicy American pub food to put us into food comas so we could fall asleep easily into our heavenly bed at the Astoria. 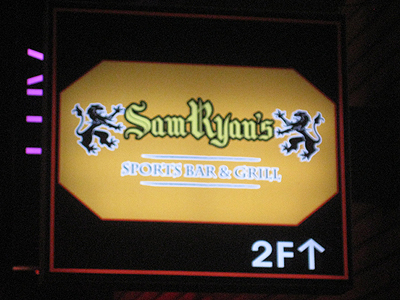 Sam Ryan’s, the pub we visited our last time in Itaewon, fit the bill perfectly. 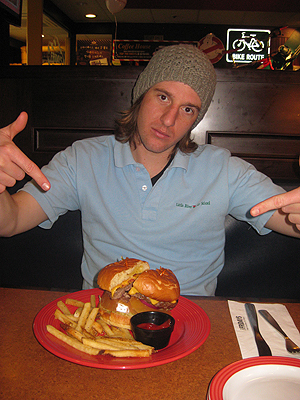 Evan’s order was a no-brainer — basically, if there is something that combines beef, cheese and bacon on a menu, you best believe that will be his choice. I opted for the steak sandwich with chutney, cheddar and caramelized onions. Oh my. The juicy steak melding with the tangy cheddar, a touch of sweetness from the chutney and the onions melting when they hit your tongue… and the bread! The bread was fresh and soft. I die. This picture does this wonderful, amazing concoction no justice. 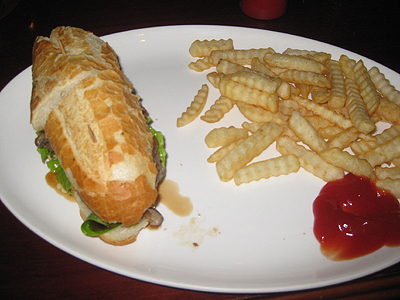 It’s actually a terrible photo, but I was exhausted and impatient to eat. Be happy I snapped anything! There are no words to tell you how much I dig sandwiches. The combination of textures, temperatures and flavors have always done wonders for my palette. Subway was a regular fixture on days I would eat out when I was working in L.A. How I took fast, cheap and flavorful sammies for granted! In Jeonju, there are slim pickins’ for fixins’ and you end up with a sliver of meat, tired veggies and sub-par bread, all totally over-priced. It wasn’t hard to decide that on our last morning, we would get another sandwich after upping our temptation with the pub grub. 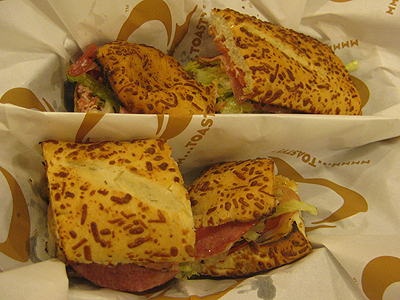 At Quizno’s, I ordered an Italian sub and relished in every single bite. Hot pepperoni, salami, crisp lettuce and tomato, gooey mozzarella, pepperoncinis with a kick. YUM! Now I’m home, drooling over my memories and trying not to scarf down more snacks because I’m salivating. 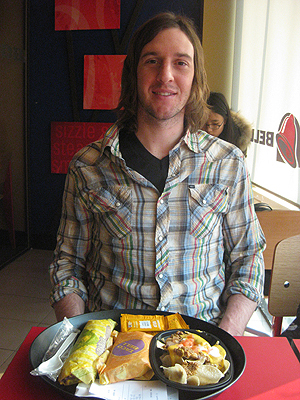 So after our successful Taco Bell stop in Seoul, Evan and I met up with my college friend, who lives in the city. 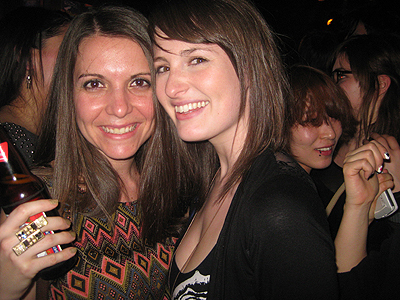 One of her pals threw a soiree, so we grabbed some wine and headed out toward Hongdae. After recovering on Thursday and sightseeing on Friday and Saturday, we were ready to brave the town again. 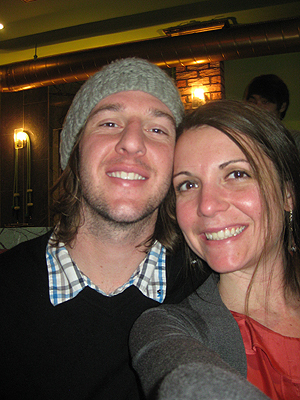 This time, Evan and I met up with our co-workers, Greg and Rachel, for an early Middle Eastern dinner. The company was delightful but the cuisine was simply too sub-par to, as I announced after our meal, make it into the blog. We left Itaewon after eating, grabbed brewskies and soju for the subway, and headed to Hongdae to get a bit more partying in. 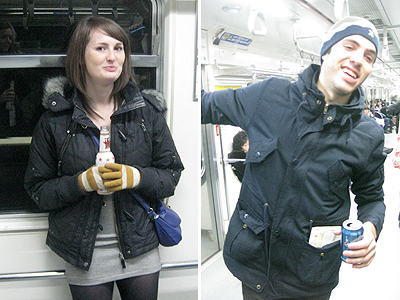 We met up with Tim and his friend near Hongik University, and all headed to a fascinating little hot spot. 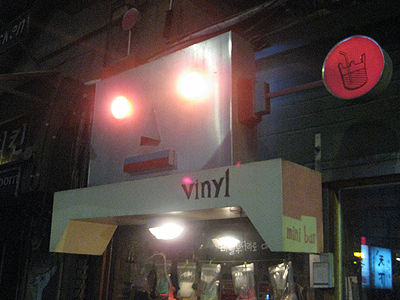 Vinyl in Hongdae, a hip hole-in-the-wall that was rocking a walk-thru window, a funky robot sign and Cold War Kids on the jukebox, was a dimly lit, bohemian closet nestled on the edge of the college town. 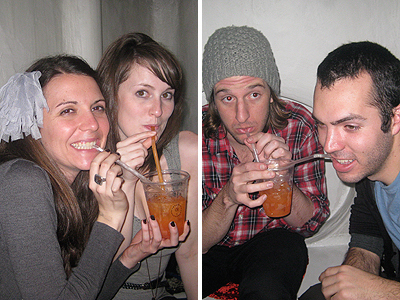 The drinks were strong, cheap, and made to go! Who needs glasses when you can have your drink in a sturdy, plastic bag complete with a straw? On Rachel’s recommendation, I ordered two Woo Woo cocktails — a lethally delicious combination of vodka and various fruit juices. We loitered on the animal print seats, sipping and taking in the artsy decor, before getting a drink to go and heading to the next party stop. After securing our zip-lock cocktails, we moseyed over to Oi in Hongdae, which was a bar that pulled you straight down the rabbit hole and into another dimension. Oi (pronounced oh eye) is a bar, lounge and hookah bar that my cousin’s friend told him about. It is quite literally hidden from view, with only a small sign indicating it was on the third floor of an unassuming building. There were no edibles labeled “eat me,” but we had definitely entered a complex labyrinth complete with mushroom-shaped caves, white wash, giant fringe hanging from the ceiling, glittering lights, and lots of tunnels and bridges to make us feel like we were tip-toeing around a maze all evening. 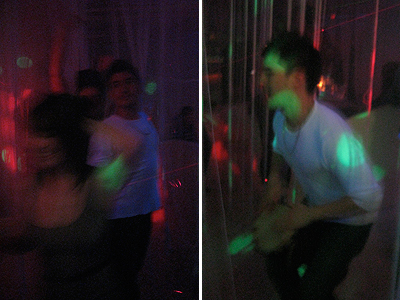 We grabbed ourselves a cave, grabbed some beers then hit the dance floor! The deejay played old school hip-hop mixed with modern electronic, and it was the perfect combination to get everyone moving on the multi-tiered floor. 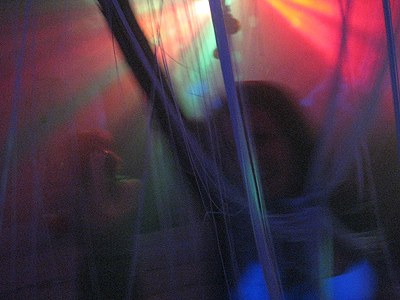 Expats and locals swarmed the club, swaying under the lights and grinding in the fringe “cages.” This inevitably led to a photo shoot (don’t they always?) and we had fun being silly with the camera and a few prop drums nearby. I, of course, got overly excited running to the dance floor and have a lovely, purple and green souvenir on my knee to remind me of the sinuous (almost river-like) architecture Oi is so fond of. Ouch. 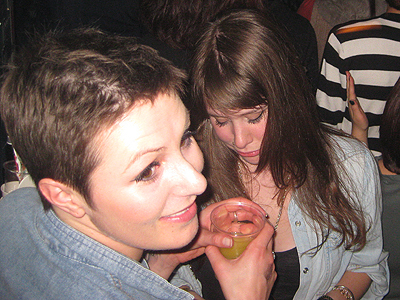 We stayed at the club so long that the bartender sent us over a few free drinks — we shut the place down! It’s just how we roll. No, Kim Jong Il hasn’t recruited me to do any work for the North Koreans — I’m staying as far away from that border as possible. 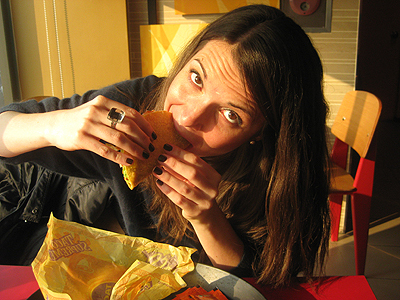 I’m talking TB baby, the one run I could never resist, whether it be early in the morning or late night in Long Beach, zooming through the drive-thru to get my fix. 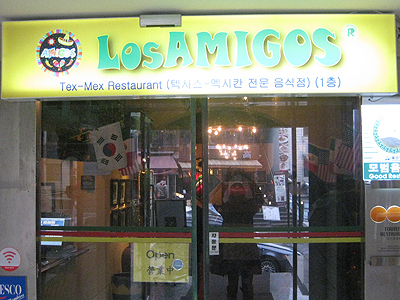 This pseudo-Mexican eatery was our first stop during our five-day trip to Seoul last week to celebrate Solnal 설날, or the lunar new year. The holiday fell on a Wednesday — Friday this year (woo hoo) so we packed our bags, hopped aboard a bus and spent the better part of a week in the north. 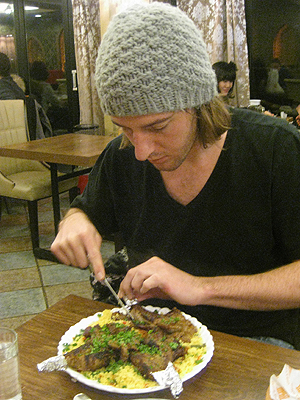 While Koreans around the country dined on tteokguk 떡국 (rice cake soup) and bowed to their eldest family members, Evan and I headed straight for Itaewon (aka foreigner’s heaven) for five days of non-Korean cuisine. Starting with the Mexican fast food joint everyone loves as it’s going down. 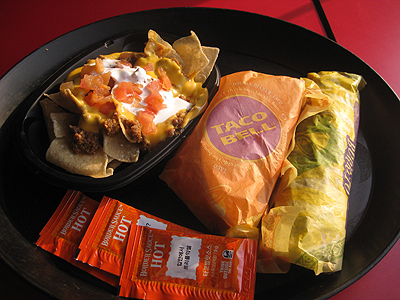 You see, T. Bell is right up there with Ice Cream Snickers as a debilitating weakness of mine — I know it’s bad for me, I know its going to beat up my tummy for a few hours, but I just can’t resist the ooey-gooey refried beans, orange cheese and all the fixins’. Disgusting but true. 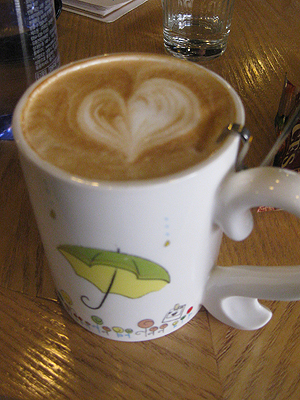 We arrived in Itaewon around 2:30 PM, just as the lunch rush came through. 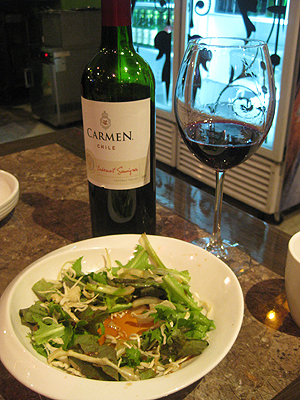 I was shocked to see how popular the eatery was with not only foreigners, but Koreans as well. 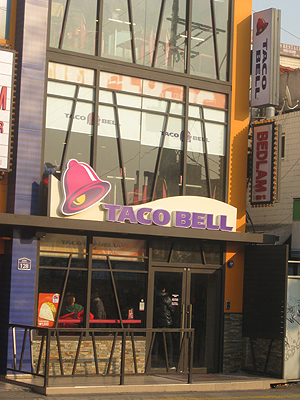 The fact that Taco Bell closed their original Korea locations in the early 1990s due to lack of interest, and now they have lunch lines that stretch out the door, really speaks to how the demographic of this peninsula has changed. Not only are there hordes of waygooks from all around the world that call Korea home now, but the locals have embraced culture from the west more wholeheartedly — including the greasy, deliciously fatty food. 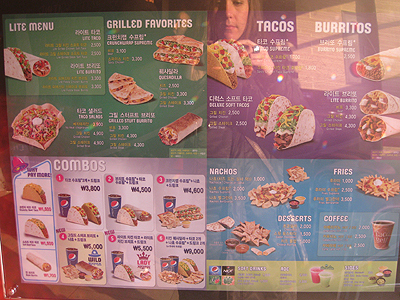 The menu had all of the cheapo staples on it (burritos, tacos, nachos, etc.) and the “lite” menu was much more extensive, but I was more fascinated with the items I didn’t recognize. Nacho fries? Oh em gee. Thank goodness I have spent the better part of my year in Jeonju, where foreign food is relatively hard to find, expensive and the choices are limited. 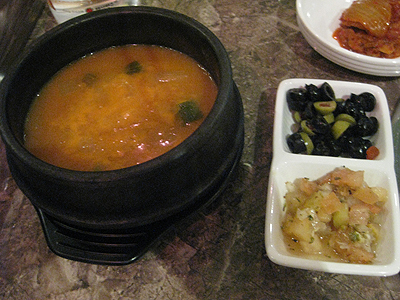 Basically, Korean food is always your best bet here. But despite my Asian-inspired diet, better understanding of reasonable portions and the recent controversy over the legitimacy of T. Bell’s “beef product,” I not only ordered multiple items from the TB menu, but ate them all until I was beyond full — and enjoyed every last calorie-laden, nutritionally-devoid bite. I literally fulfilled dreams I’ve had about Taco Bell in the past few months. After inhaling my taco supreme, nacho “bell grande” (nacho supreme) and bean burrito, it took approximately 20 minutes for my stomach to begin feeling like a rusty meat grinder, but it was worth it. So worth it. Honestly, I considered ordering more food before Evan gently reminded me that, at times, my eyes can be a tad bigger than my stomach — and by a tad, I mean I order enough food to feed an army. On our last day in Seoul, I’m slightly embarrassed to admit that we returned to Taco Bell directly after eating lunch to buy more food for the ride home. Oh, and I tried to steal a bunch of hot sauce to take back home with me, only to realize that the bins of condiments next to the soda machine were ketchup! Barf. 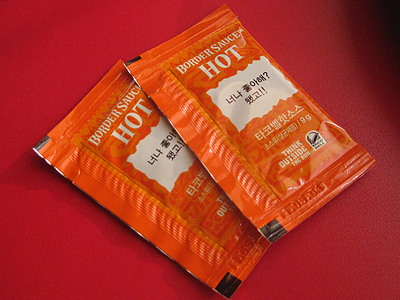 The Koreans must be on to the American way of hording packets from fast food, so we got a designated amount of sauce — from behind the counter — with our meal. I justified these fatty excursions, along with the rest of my gluttony during Solnal, with the fact that I was on vacation!